I wonder if there is any existing or a way to create a chess database organised only according to pawn structures, where the notion of a pawn structures is crudely defined by GM Andrew Soltis in his book Pawn Structure Chess and GM Mauricio Flores Rios in his book Chess Structure: A Grandmaster Guide as shown in this Wikipedia article? I have the first book and I read a free excerpt of the second. The software I am currently using is SCID vs PC. 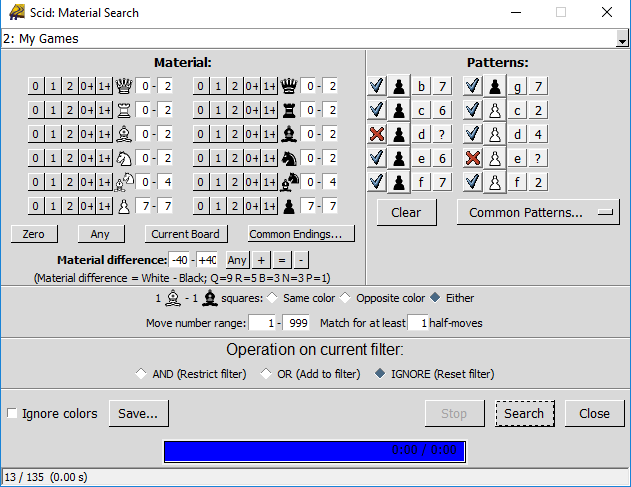 In SCID, from the Game List you can select the "Change filter" icon followed by the "Search for material or board patterns" icon. In the window that pops up, you can select the location of up to ten pawns. Although ten is not enough to specify the pawns of both sides, you can also separately specify the number of pawns each side has. In this example, for a game to match the filter, Black must have pawns on b7, c6, e6, f7, and g7, no pawn on the d-file, and exactly seven pawns. Additionally, White must have pawns on c2, d4, and f2, with no pawn on the e-file, and exactly seven pawns. Not the answer you're looking for? Browse other questions tagged software database pawn-structure or ask your own question. Any database that will return the reversed position? Which online database is the best?